The T4111 Single-Use Elastomer Bellows Cartridge Seal is a general-purpose sealing solution for low-duty applications. The company says that during testing the T4111 reduced installation times by at least 50% compared to elastomer bellows component seals or traditional packing options. In addition, the cartridge design and material selections reduce installation costs. It has a strong mechanical drive with a seal head drive mechanism that eliminates overstressing of bellows. Its non-pusher elastomer bellow design prevents sleeve fretting damage caused by pusher O-rings, there is a non-clogging, single crest-to-crest wave spring which is not affected by build-up of solids and a low drive torque. 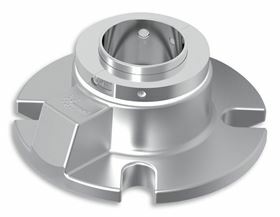 This new seal is suitable for aqueous solutions such as water and wastewater treatments and applications within the food and beverage industry and mining and metals processing markets.